Construction season has reached its peak, and now Jack Frost is peaking through, covering the ground with nasty ice and wet snow. 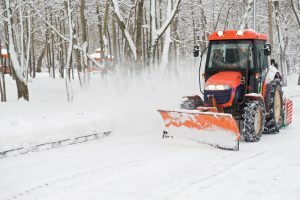 Smart construction businesses know how to properly store their equipment before the brutal winter weather hits, preparing a long check list of maintenance to-dos that will ensure the protection of their machines. Below is a list of preparations you should make before storing your construction equipment away for the winter. The last thing you want to discover as you rev up your once-idle machine’s engine for the first time after a long winter is that the battery is dead. Preventative measures should be taken as early as autumn and you should start with the most important measure: removing the battery from the machine before storing them away. Prior to doing this, always clean the battery of debris and dirt, which can drain its energy faster. A little baking soda, a terminal brush, and some elbow grease should do the trick. Three elements important to the maintenance of your machine’s engine during winter are fuel levels, lubrication, and air filtration. You should clean the fuel tank cap and vent and check the water for debris as well, in addition to changing the oil in your machine at interval levels according to its instruction manual. You should inspect your machine’s cooling systems frequently and make sure that the radiator coolant is always at cap level. The coolant system is a vital force in the operation of your machine because it prevents corrosion, increases boiling point temperature, and prevents the system from freezing. Never mix conventional or OAT coolants together; the deadly mixture of the two could damage your machine. Are you trying to squeeze a project in before winter strikes? Lawrence Tool Rental has the equipment you need for all of your construction site needs, including tractors, track loaders, and mini excavators. Contact us at 317-826-2654 today!